Marriage is beautiful, no matter if it is arranged or love, but with changing times, there is a dire need to understand and respect the viewpoint of your partner, which originates only when you spend sufficient time with them. Arranged marriages generally happen with the intervention of family, they choose a person for ‘you’, with whom ‘you’ have to spend ‘your’ entire life. Ironic, but it has been ‘called’ a successful method of choosing partners or unifying two families, or shall we say, it has worked as a great cover for years to hide away the painful saga of torture and disrespect. Many women, are trapped in their marriages primarily because of families. Family will not allow her to take a divorce. Partially, those women also consist of females who aren’t that much educated to take a stand for them, and then they get pregnant, have kids, and the trap strengthens itself around the woman so much, that before she can consciously decide to separate herself, and do something substantial with her life, she is 50 and has nowhere to go. Again, not all arranged marriages are like that. I’ve also seen many beautiful, fulfilling, and lovely arranged marriages in my own family, which seems like a dream come true! But the reality will not change. Arranged marriages (earlier) were the most popular way of getting your son/daughter married, because the interaction between (Indian) males and females was very limited. Both, schools and colleges were gender-specific, and in jobs too, not many women were enrolled. Mostly women opted to become housewives because of lack of education opportunities and more intervention of families in their lives, so their interaction with the outside world was also limited. Those women, who somehow had some male friends, or fell in love, were treated as rebels, and one or two cases of bad love marriages, also ran for generations in the families as an example of ‘defying your parents‘ and ‘listening to your dumb brains and spoiling your life in return’. They (families) will not list out examples where their decisions went wrong, but will proudly show off where decisions of a child went wrong. They will never agree or accept that they spoiled someone’s life by forcing him/her into marrying someone they didn’t even know! Because according to Indian logic, you can’t talk to any guy/girl for 25 years of your life, but after that, one day, suddenly you will have to sleep with one! Why? Because we say so. Not only this, but you will even have to reproduce and give us grandchildren, doesn’t matter if you want it or not, or if you’ve even known the person enough to plan a family! Applause! Ladies and gentlemen, a round of applause for such a rebellious logic. But with time, we saw a drastic change. Love marriages started to happen more frequently, both men and women started making decisions, and some of them also had to sacrifice their lives in the process (honor killing). But the saga didn’t stop. Nobody likes to be forced, and nobody likes to be thrown into something deliberately. 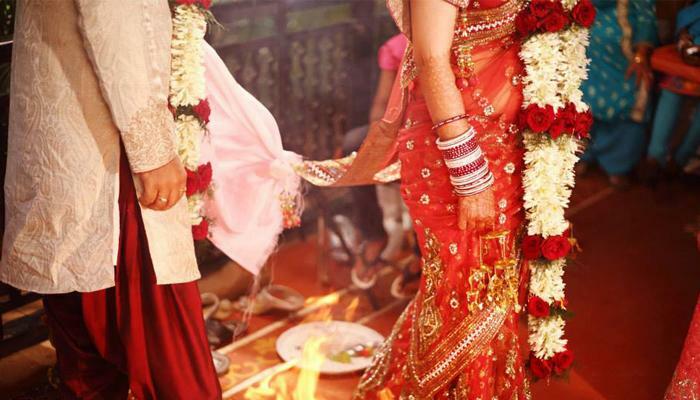 Arranged marriages started reducing in numbers, and there was a substantial rise in love marriages, a trend that is on rise even today (2017) in India! But not all love marriages were successful either. There were some cases of cheating, fraud, scam in love marriages. People used ‘love’ as a trap to cheat other people, and then there was a whole another story about Love Jihad. Where Muslim men were accused of trapping Hindu women in their love affair, and then marrying them solely to convert their religion and increase population of their own religion. Yes, as stupid as it sounds, there were rituals performed to correct them, known as Ghar Wapsi (home-coming!). Yes, sometimes reality in our country can be more dramatic than our TV serials! Anyways, coming back to the point. EQUALITY: Love marriage means both – guy and girl have independently decided to spend their life together. Which is a good sign of equality of both the genders, and also respect for life. They don’t want to do it because someone else told them to, but they want to do it because they felt it’s the right choice for both of them! SOLE DECISION MAKERS: Since here, both the guy and the girl are the sole decision makers, so whatever happens next will be their own responsibility, which again reveals your own maturity to take a decision in your life! If you are able to choose a right person as your life partner, believe me, more than 50% of your life is sorted, because career, professional life, even children don’t affect your life as much as a bad life partner can! NOBODY TO BLAME: Even if their marriage is unsuccessful, at least they will not have someone to blame! The worst thing that can happen to you is – being punished for a crime you didn’t even commit! And that’s arranged marriage summed up in a sentence. If you haven’t decided your life partner for yourself, then how can you blame yourself if your life is screwed? Regrets will take the better off you, and you can only blame your parents/family but believe me, you will be in the most helpless condition at that time. Because on one side, they will be forcing you to ‘stay’ in that toxic marriage, and on the other side, you will want to break free! I AND YOU, BEFORE US: This might sound selfish to some, but it is one of the most important points that I’m going to mention here. ‘I’ and ‘You’ before ‘Us’. This is a statement you will only come across in someone who has spent sufficient time to understand each other, and to understand each other’s dreams. When you come together with the sole purpose of ‘marrying‘ each other and spending a life together, your motives, your dreams are more likely to be in a direction which involves the both of you in a collective pattern, but when you have spent sufficient time knowing and understanding each other, you are more likely to take decisions which first involve both of you in an independent manner, and then you decide about yourself as a couple! This is a general trend that I have personally observed in love and arranged marriages both – that if the couple has spent a lot of time together before getting married (may it be arranged or love), they are more likely to share a tendency of motivating each other to pursue their individual dreams, like going for a degree program, even if it includes staying apart for sometime, but if you understand how important it is to your partner, you will do that for him/her, or even a small decision like joining a job! Doesn’t matter how much money you make, but if your wife wants to work, you are more likely to support her decision solely because you ‘understand’ and ‘know the importance’ of that one decision in her life. It sounds stupid, sexist and very selfish to me, it’s nothing but a cheap way of showing your male dominance towards your wife! If she wants to work, you are nobody to stop her. First, you demand someone who’s educated enough to be your wife, and then you want her to sit at home and change diapers of your children? What logic is this? And then comes the ultimate rant. Oh my God! What did I say? It’s like saying Voldemort in a Harry Potter ball-room. Divorce is such a shameful word that some people think it is better to spend a horrible life with a person you hate, than taking a divorce and doing something else with your life! Honestly, there are many examples of successful women who have succeeded only after they stepped out of their miserable marriages, but for some people, seeing the girl suffering is better than seeing her being successful. Some things are frankly beyond my understanding! May it be the logic behind arranged marriage, or the orthodox mentality of the husbands who don’t allow their wives to do a job, or may it be ‘divorce’ and all that stigma around it. Society is changing, and even India is changing, but it might take time. It might be long before we finally come to terms with our own reasoning and logic. It might be long before we accept openness in our society, and we talk about things that we otherwise prefer to keep locked and confined inside the darkness of our bedrooms. So, what is the answer? Love marriage or arranged marriage? This is an excellent article, I have come across in recent times. Although I have my own views on arrange marriage but you have covered love marriage quite beautifully. Very nice. Mam its nice and every parents have to think like ,,,what how it can be happen??? I really miss your answers on Quora. I wasn’t aware of your ‘being silent reader’ thing and I was just scrolling through the feed and realised that ‘are inke answers kuy nahi dikh rahe’. First one of your blog post I came across today. I agreed with your article most of the point which raised up by you and explained in well mannerd and positively replied. I think overall both ways of the marriages can be a wrong or right decision but taking anyone rights is not a correct decision. Just came to know that you left quora but I am not member of that yet but I was just try to get answer of something and finally read a few lines of you and redirected to your web. I am siva.,is it your own word,! just asked. Hey there!!!! I’m a big fan of your stories. I have read all of them. I start to read your articles too. Your writing is damn great. If you don’t mind may i know when are you planning to write another story????? Probably after my masters ends! 🙂 I am currently in college doing Master of Design, which is ending this May, so hopefully after that! I am very very thankful to you your words mean a lot …I will try and get over my ex u really wrote too well how to move on. Thanks again for sharing your blogs. But I have seen so many couples in my life that they are so happy in their arrange marriage life. I agree that it also has its demerits but everything has cons and pros.